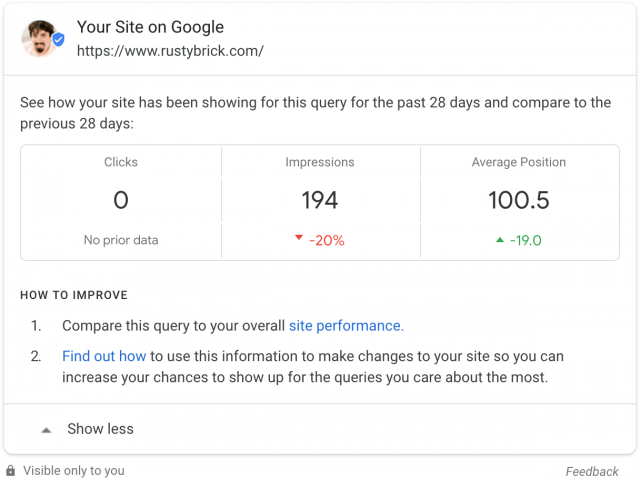 Google Search Console Stats Within Search Results To Site Owners Rolling Out | The SEO Dr.
A month ago we reported Google was testing showing a stats box in the search results from your Google Search Console data. It included showing clicks, impression and average position with some tips. It seems like as of this morning, it is now rolling out to everyone – if they are logged into their Google account and have verified profiles that match queries for the site. Of course, this helps bring more awareness to Google Search Console for those who may have set up a verified profile and barely checks in on it.